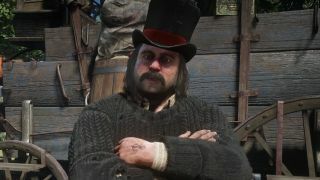 In Red Dead Redemption 2, there are many different things you can upgrade as you progress through the story, from your horse and your weapons to how effective the healing items you use are, and it's fair to say that the Arthur Morgan you end the game with will be much changed from the man you start as - especially if you grow out that facial hair! Something you should prioritise as soon as you can are Red Dead Redemption 2 Satchel upgrades, as there are seven of them in total you can craft and each will improve your carrying capacity for one specific type of item. You can get started on these upgrades as soon as you reach Horseshoe Overlook, though you'll first have to invest in the leather crafting tools from the Red Dead Redemption 2 Camp upgrades list as you can't craft any of the satchels without them. Once you've got the right tools for the job, take a look at our complete list of Red Dead Redemption 2 satchel upgrades below for the full lowdown. We've included the benefits gained for each one, as well as everything you need in order to craft them, to make things as easy for you as possible. Want to know where to hunt for the required animal parts? Then check out our complete Red Dead Redemption 2 animal locations guide.